← It’s SFR Brigade Showcase Time! Deadline for Issue #9: 15 November 2015. Story should meld the Science Fiction and Romance genres, and must have an upbeat ending. Not quite sure what we’re looking for? 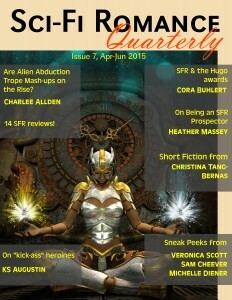 Read our original fiction in previous issues. No multiple submissions. No stories that have previously been rejected by us. Simultaneous submissions are accepted, but please inform us if the story is placed elsewhere. Submit: Standard manuscript format, please. Send brief cover letter with biographical information and publication history, along with attached story (.RTF or .DOC format) to Diane Dooley — Fiction #at# SciFiRomanceQuarterly #dot# org — by deadline. This entry was posted in Science Fiction and Science Fiction Romance and tagged 1Night Stand Series, Sci-Fi Romance Quarterly, science fiction romance, SciFiRom, SFR. Bookmark the permalink.